Meria Heller is a celebrity, her smash podcast heard in over sixty countries, hosting top authors, environmentalists, humanitarians and alternative Doctors is only part of her celebrity status. Now in it’s 11th year, it is the number ONE show of it’s kind worldwide. Nominated for the 2001 Peabody Award for Excellence in Broadcasting. Her guests are a who’s who of the best people on the planet, from Governor Jesse Ventura, Kitty Kelley, Gore Vidal to Dr. Arun Gandhi. Meria can be heard on Progressive Radio Network Sundays at 3pm (ET)/ Noon (PT). Caryn Hartglass: Okay, we’re back. I’m Caryn Hartglass and you’re listening to It’s All About Food. And I want to continue connecting the dots. We were connecting the dots before with how the corporations connect our food choices. We think we have freedom to purchase the things we want but there’s so many things going on behind the scene that we need to pay attention to. And it’s all about connecting the dots. Now, we’re going to talk a little differently about connecting the dots. And I’m really looking forward to this next half hour. One of the things we’ve been doing at the Progressive Radio Network is working with other hosts on the show. And it’s been fun for me because I get to learn about other great hosts on this network, all the great work that they’re doing. 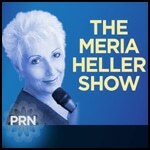 One of them is our next guest, Meria Heller, who is, in addition to being a PRN host of the Meria Heller Show, she’s an American writer, speaker, and Reiki master and a lot more. And I’m just going to bring her right on right now. Welcome to It’s All About Food, Meria! Meria Heller: My pleasure. Thanks for having me on, Caryn. Caryn Hartglass: Oh, Gosh! I’m so glad to have you on because I want to know more about this universal wheel and what you’ve been doing and how we can understand, I guess, all life on Earth. Meria Heller: Well, there’s a loaded question! Caryn Hartglass: Much for a half hour! Meria Heller: Well, many years ago I met a very wonderful teacher. His name was Sun Bear and he taught a Native American medicine wheel. I studied with him and I got totally involved in it and the philosophy of it and developed what I called the universal medicine wheel, which eliminates any barriers as far as your ethnicity, your sexual orientation, your religion, et cetera, etcetera. So that people can truly understand that all life is connected and that we’re a part of it and we all depend on each other and every living thing for our own web of life. On my own radio show at meria.net, I talk about a lot of political things going on but it’s all connected to the same message: we either learn to live in a sacred manner or we perish as humans. Caryn Hartglass: Yeah, I love that. And unfortunately, we’re seeing a lot of degradation today because many of us are not living in a sacred manner. We’re taking so many things for granted for the sake of convenience and comfort without really considering all the repercussions. Meria Heller: I think one of the areas we are at least living in a sacred life is our own personal life. And that’s where change begins, with your personal life and your personal choices. I heard a little of your show and it talked about our food choices. Well, our food choices are the most important thing. That’s really pretty much the only vote we have left so if we’re buying processed food and eating animal products, we’re voting for the torture and slaughter and murder of innocent animals. Even though someone else is murdering them for you, you’re taking that polluted, tortured energy into your body. So how sacred is your temple? How sacred are you treating your own body? I’ve been myself, as a personal choice, an organic vegetarian for thirteen years now. Caryn Hartglass: Woohoo! Bravo! Thank you! Meria Heller: I feel really good about the fact that nothing has to die for me to eat. And even when you do take your vegetables, your fruits, you also need to take them in a sacred manner because they too have a living force, obviously the best living force for the physical human body. Say a prayer over it, Reiki-ing your food, appreciating it, is very important. Caryn Hartglass: Can you just tell me what you just said, Reiki-ing your food? What does that mean? Meria Heller: Well, a lot of people have chosen to become Reiki practitioners. Reiki is a hands-on healing technique. It’s a very old technique. I am a Reiki master. So once you’ve attuned to that energy, all you need do is put your hands over your food to purify it. I just keep telling people, back in the older days people used to pray before they ate. Today, you need to pray before you eat because you don’t know what’s in the food. Caryn Hartglass: And it may sound a little out there, just to put your hands over food. But I want to tell you my own brief experience with Reiki. And I know that there are a lot of people that study it and just like any field, there are some people that are amazing at it and some people who probably shouldn’t be practicing and need to do a lot more work. But I had one experience when I knew absolutely nothing about Reiki, did not know what to expect. I met someone who said he would just show me a little bit. And I lie down and I didn’t really…I had no idea what he was going to do. I closed my eyes. I was relaxed and all of a sudden, I felt this surge of energy, from my temples to my toes. I opened my eyes, almost in a panic, because I didn’t know…I thought it might have been some sort of massage like other kinds of Swedish massage or something. I didn’t know what it was. And I opened my eyes and said, “What are you doing?” And he had his hands raised above my body, maybe a foot or more. He had incredible control of energy and I felt it instantly. And I’m sure there are lots of different ways to manifest it in people, have different…have their own styles. But I was an instant believer in the power of this energy transfer. Meria Heller: Well, half the word Reiki is ki and everybody has ki energy, that’s what your body existing, that’s what keeps you alive, that’s your living energy. A true Reiki practitioner never has to touch you in order for you to benefit from that energy as they channel it to you. Caryn Hartglass: Well, it’s amazing and I’m a believer. Meria Heller: Well, good. But you know, you’re not a Reiki practitioner if you’re into healing arts in any way. It’s always a good idea to say a little prayer or put your energy into the food. Thank the food for giving its life force to you. Caryn Hartglass: Now, is there anything specific other than putting your hands over the food and saying it to…? Meria Heller: Well, you want to eat clean food. You want to drink clean water. That’s urgent in a day where … I just got a news story today that the FDA has found that a lot of food that they’re selling us is fake food. It isn’t what they tell us it is: everything from olive oil to lemon juice to pomegranate. So you have to become a wise consumer whether you wanted to know about these things or not. You need to know or you’re going to end up sick with illness, which will then send you over to the other half of the food production company, which is the pharmaceutical company. People have to understand that the same people that own the big food companies own the big pharmaceutical companies and the diet centers. Caryn Hartglass: One thing I’ve learned in this book that I was just talking about, Foodopoly, she just has a number of great diagrams in this book that show how all the bad guys are connected. Meria Heller: Absolutely. I had interviewed Kevin Trudeau a while ago on his…one of his latest books and he makes the connection. He names names. You can’t afford… we’re not eating the kinds of food our grandparents ate, when people say, “Oh, my grandparents ate meat until they were ninety and they died,” and I’m like, “We’re not eating the same food that they had then.” Everything today is bastardized. Caryn Hartglass: I mean I don’t recommend eating meat but the meat today is not the same as it was in days in the days of yore. Meria Heller: No, no. And I strongly suggest people stay away from any kind of animal products, including dairy, because all of it is polluted. Caryn Hartglass: You started in the beginning saying that what we can do is eat fruits and vegetables and vote with our fork. I really believe in that but I’m starting to believe that although it’s very significant to do that, it’s not enough. And we need to be writing letters to our officials to make it clear what we want. Meria Heller: Absolutely. But look at the hard time we have: even when we had the referendum on the California ballot to get Monsanto to label their genetically modified food, Monsanto’s money won out. Even though there were laws on the books to label our food since 1995, they still have not put the labeling on our food and that’s a lot of lobbyists’ money. We wait for people to continuing to lobby organic consumerism and people like that but the bottom line is, by the time that happens, you could be deathly sick. Caryn Hartglass: I know. I had my own personal romp with illness and I got out of it, fortunately. That’s a whole another story. One of the things that I did was, not only was I already on the vegan diet, but I started to juice. And I believe you recently got into juicing yourself? Meria Heller: Yes, I did. All of a sudden last weekend, I got hit with some killer migraines. I haven’t had those for several years because I do also weight training six days a week. And I want your audience to know I’m over sixty. Caryn Heller: Woohoo! Right On! Meria Heller: And my last physical six months ago, I would put my results up against anybody in their 20s. The body needs a few things: it needs clean food, clean water, good sleep, and exercise. It’s not that difficult. Caryn Hartglass: Yup, that’s about it. People seem to understand that, when it comes to fancy cars that they need to take care of them, put in really high-quality fuel, and do maintenance on them and keep them in tune. But we don’t think about that when it comes to our bodies. Meria Heller: Well, I also think a lot of it has to do with the fact that we’ve been taught against trusting our intuition. And a classic example is when I started feeling sick I said, “How is this possible? I’m the healthiest person I know.” And a little voice inside my head said, “Juicing.” Well, I immediately started juicing the next day. Caryn Hartglass: Well, I’m a big believer in juicing. And there’s all kinds of discussions about what it’s good for and when it’s good. So many information I don’t agree with out there but I know it’s really helped me and I’m really committed to it. But let’s talk about listening to that little voice and how we can tune into it and know that it’s the right message. Meria Heller: You have to learn how to trust it. Once you see that it’s right most times, you’re going to learn to trust it. And the way to hear it is to just be quiet. So many people, their problem is that their mind never shuts off. Do whatever it takes to get into a form of meditation, whether it’s listening to classical music, or sitting down and writing, or working in your garden, whatever keeps you totally focused on what you’re doing. Concentration is meditation. And then all of a sudden, you get these great eureka ideas. You’re like, “Wow, why didn’t I think of that before?” You did, but you weren’t listening. Caryn Hartglass: Yeah, I think that’s really, really important and something that we all need to learn how to do because we know it all. We really do. And a lot of people think they know it all; they don’t know anything. But internally, deep inside, we do know so much. Meria Heller: Well, yeah. But everything in the world is set up to seduce you into all the wrong decisions. You sit in front of the T. V., you can sit in front of it for an hour, you’re going to see fifteen different ads for either some new fast food garbage, or some new pharmaceutical convincing you that there’s a new disease out there and you have it. So people have to start being discerning and then just walk away from that and start doing some work on your own, start reading the right books, the books you tout on your show. One movie I’d love to share with your listeners is called “Fat, Sick, and Nearly Dead.” I’ve watched that several time now and I think everybody should watch that movie because… And when you see the results of juicing on some pretty serious cases, I think it’s very convincing. Caryn Hartglass: It is, but what people need… I think some people get confused because they use juicing as a temporary fix without changing their bad habits, where they use it for weight loss without changing their habits and then when they stop juicing, they go back to their old habits and then there’s a roller coaster and that’s a serious problem. But that movie really was powerful and it was real, especially the second part where a new character is introduced into the film, which wasn’t really expected when they started creating the film. Meria Heller. Right, right. But the best thing about juicing is it’s a great detox: you don’t have to do it for your whole life; you don’t have to do it for three meals a day. It’s a wonderful way to get you used to eating real food so it’s a very good bridge to becoming a vegetarian because you do lose the taste for all the garbage that they have out there. I mean, the three seductive tastes in most restaurants are fat, salt, and sugar. Caryn Hartglass: Yup. SOS: sugar, oil, salt. Caryn Hartglass: There’s one cookbook that I like from the True North Health Center. Alan Goldhamer has a sous chef there, Ramses Bravo and they put out the Bravo! cookbook and they promote SOS-free food, free of sugar, oil, salt. You put out a book list. I found it when I was preparing for this show of books you recommended from 2000-2010. And I’m really glad that I found it because there are only really about five books on that list that I’ve actually read, and so many more that I haven’t. Meria Heller: Right. A lot of those books are they were all people I’ve interviewed and now, since I changed the format the new […] I interviewed are just…I have a copy of the book within the archive of the book. One of the most excellent books, especially if people want to be in a true spiritual journey is the World Peace Diet by Will Tuttle. Caryn Hartglass: Amen, amen, amen. Meria Heller: He was one of the most courageous writers and the only vegetarian writer to make the connection between the energy of those tortured animals and what does that do inside your body. And I think that’s why so many people are so angry and depressed all the time. And they don’t make the connection: we’re connected to all living things. Caryn Hartglass: When you realize that you can thrive…when you can live and thrive without consuming animals and you break away from it, you feel very different and some of it isn’t explainable but I think it could be something like what you’re talking about: when you stop consuming the fear, the frustration, the confusion of other animals. Caryn Hartglass: That is funny! Meria Heller: So she noticed it and it made me take pause and I said, “What’s the difference? Why do I have this inner peace?” One of my friends recently accused me of being the fifth element. You might say the fifth element because even though you have stress like everybody else in your life and situations are going on, you never lose your inner peace. Well, I have to attribute it to the fact that I’m not eating terror. Caryn Hartglass: Yeah. I am not comfortable with arguing; I don’t like it. I don’t mind confrontation where I can bring up some points where things aren’t right but I don’t like arguing. I like to stay in this place of peace. It feels so much better. Meria Heller: Absolutely. I mean, you sleep well at night and life is a beautiful thing. And I never try to force my lifestyle on anyone else. But when people look at me and say, “What do you do to look like this? What do you do to stay this healthy? What do you do to stay so even keeled?” then I will tell them. But it’s a matter of making a commitment to yourself and realizing your body is your computer. Caryn Hartglass: But how did you make that decision, to go vegetarian and vegan? Meria Heller: Well, for me, I’ve dragged it out for so many years. I was going to Tahiti once and I was reading John Robbins’ last book, I think it was The Food Revolution. And I realized I could no longer make any excuses. You can’t be … you can’t claim to be an environmentalist and eat animals. Caryn Hartglass: Oh, but please, they all do! So many do. Meria Heller: I understand. I understand and I’ve dropped subscriptions to a lot of environmental magazines because they have recipes in there for animals. And it really is true. So I decided that I wasn’t…I couldn’t make the same excuses. Believe me, I made the same excuses everyone else does. And the bonus was, two years into being a vegetarian, my thyroid repaired itself and I no longer had to be on thyroid medication. Caryn Hartglass: Oh, good for you. Caryn Hartglass: I know. It’s really heart wrenching. You probably know that there’s a lot to it to this whole obesity scenario. I really believe that food can fix it but we’re learning so many different things about all the artificial chemicals that are in the environment, in plastics and in the can liners, the endocrine disruptors, that actually encourage us to get fat, that some of it is out of our control, to some degree. Meria Heller: Well, it’s out of your control if you let it be. People can make that choice: “I’m not going to eat processed food.” When I go to the supermarket it’s very easy. I only hit the fruits and vegetables and I’m gone. Caryn Hartglass: It’s funny. I don’t see anything else as food when I walk into a supermarket. Meria Heller: I run away from the meat cases. I’ve been doing that for years because I could almost hear the screams coming out of that cage. Caryn Hartglass: Yeah, I can hear them too. And it takes a certain amount of energy to turn that off because I wouldn’t be able to function and do anything productive if I let that frequency in. Meria. Heller: Exactly. Well, think about the frequency of eating that. Caryn Hartglass: Yeah. I don’t want to think about it! I don’t do it. Meria Heller: Well, I’m talking to your audience because look, I’m just like everybody else, just a human being trying to figure it out as I go along. But after a while, you have to say, “Enough is enough.” And when you look at the deliberate poisoning of our food supply, which is deliberate. It’s all about money. You become lazy. You’re not interested in what your government is doing. You’re too busy eating like a slob and feeling like crap. Your mind’s not working and this how tyranny begins: when the people are so out of shape and so whipped by the end of the day that they don’t care about anything else, don’t care about the injustice going on around the world. They’re easy to control. Caryn Hartglass: Do you think that is clearly intentional or just that they’re …? Meria Heller: Oh yes. I no longer have any doubt. Years ago I wanted to live in La-la-land like most people but because of the research I’ve had to do for my show I think that it’s a deliberate … if you add in the poisoning of our air with chemicals, the poisoning in our food, the filth in our drinking water, no one should be drinking tap water, add vaccines and pharmaceuticals to that and you’ve got a perfect mix to control the people, control the population through lethargy, no empathy, just laziness, sloth, desperation, fear, you name it. Caryn Hartglass: What are you drinking for water when you don’t drink tap water? Meria Heller: Well, I first had started out with reverse osmosis system. And I live in the mountains of Arizona. We have pretty clean water but I still use a reverse osmosis system. And then I use a […] and water filter, which puts the minerals and vitamins you need in water back in the water. Meria Heller: If I’m at a friend’s house and I want some water, if their water’s not filtered there’s no way I’m drinking it. I also have filters on my showerheads because don’t forget, when you’re taking a shower your skin is absorbing all that chlorine and who knows what else is in it. Meria Heller: Right, fluoride and all the rest of the mind numbing drugs. So some people will say, “That’s kind of fanatical,” but my bottom line is: who’s healthy and who isn’t? Meria Heller: If you can smell it and has a color, don’t drink it. Caryn Hartglass: Okay, we have two minutes so tell me something inspiring, something good. I always like to leave on a happy, delicious note. Meria Heller: Well, the good thing is, I think, more people… and what I’m finding, because I also do private counseling work, is a lot of twenty-year olds and younger are totally aware so I think that a lot of the work our generation has done, and I really don’t know what generation you fit in to, is getting through. But young people are getting it on so many levels and that’s one of the best sights that I’ve seen in my entire life, is that all good work is paying off. Caryn Hartglass: Okay well, Meria, thank you for joining me on It’s All About Food and I can’t wait to go back to your website and listen to a lot of your podcasts and read your books. Meria Heller: Thank you. There’s a whole bunch there for free. Just hit the “Free Show” tab and enjoy. Caryn Hartglass: Okay, free is good. Thank you! Caryn Hartglass: I’m Caryn Hartglass. You’re listening to It’s All About Food. Did you enjoy the show today? Let me know. I have an email: info@realmeals.org and I would love to hear you, from you. Thank you and have a delicious week.